Sweden. Recognised worldwide for its meatballs, its flat pack furniture, for its endless natural beauty… for its burgers? OK, perhaps they’re not globally renowned but - from my experience so far - I’d say Swedes are indeed rather susceptible to the humble patty and bun. A self-confessed burger lover myself (the sautéed ‘shroom burger from American restaurant chain Red Robin would be my death row plat du jour) I have taken on the burdensome task of sampling as many Svenska sliders as my cholesterol will allow, purely for the journalistic purpose of writing this much awaited review. You’re welcome. Before we get into it, special mention to the highly commended Max Burgers. This is Sweden’s very own McDonald’s challenger (their giant red signs can be spotted up and down the motorways) and I’d go as far as to say their grub is tasty as hell. Still very much a grab-and-go affair (we once sat in after a very exhausting IKEA trip, depressing much) but, with their meat all sourced locally, this plucky chain is dwarfing the big boy competitors here in Sweden. Power to the (relatively) little guys! I first encountered Krubb when visiting Stevie for lunch in Telefonplan, the location of their outpost south of the city. The restaurant itself has an industrial look, with quirky furnishings that underline their understated yet playful personality. It’s always totally rammed, so I’m often stalking tables for signs of satiated diners in the attempt to pounce into the next still-warm seat. It’s no surprise that this place is constantly packed full of people. Krubb burgers are consistently delicious; their chalkboard menu often serves up interesting specials that are full of fun flavour combinations, alongside an extensive list of faithful classics. In Telefonplan, the accompanying fries are 50/50 regular salty goodness and yummy sweet potato. What’s not to love. Krubb have two locations in Stockholm. Telefonplan on the fringe of the city as well as Kungsholmen for those looking for something more central. Lily’s Burger in Södermalm peppers its classic diner DNA with a host of cheeky personal touches. Their outdoor seating in the summer months brings a hefty helping of glorious technicolour to an otherwise concrete SoFo setting. Most memorably, their loo has a glass floor that looks on to a subterranean smurf village, lit up with neon lights. It’s fabulous. The burgers are undeniably tasty which you can wash down with one of the craft beers from their well-stocked fridges. There are choices aplenty, with many brewed in Sweden. Luckily the hearty meal portions will help to soak up some of those high percentage nordic tinnies. Alongside Nytorget, Lily’s diners can be found on Kungsholmen as well as in Örebro: a city west of Stockholm. Having just opened at the beginning on March, Dirty Vegan is very much the new kid on the block. As you enter past the neon licking lips logo that pays (quite literally) tongue-in-cheek homage to the iconic Rolling Stones design, it’s clear this place isn’t your average plant based restaurant. Fear not, there’s no holier-than-thou attitude or Delicious Ella style sterilisation in sight. We were greeted by an eclectic gaggle of waiting staff, bright eyed and sporting a myriad of international accents. My visit was actually during the weekend of their soft launch and our waiter didn’t really have a clue about the menu. We had a few questions such as what ingredients made up the ominous “mozzarella” sticks, it remains a mystery to this day. That aside, they’re a cheery bunch who offer friendly, chatty service (and boring stuff like knowing what’s on the menu can be learnt over time!). The food is definitely dirty and I was left feeling full for about two days after finishing the giant 3 onion burger. My recommendation would be to go with a group and get a bunch of sides to share. There’s lots of intriuging vegan alternatives that pack enough punch to satisfy almost any everyday carnivore. Dirty Vegan is located Södermannagatan. Launched by the same team behind Söder breakfast hotspot Greasy Spoon, this laid back eatery has got off to a flipping good start. It’s located in a centrum, meaning that if you don’t know about Babas then you might confuse it for a run-down newsagents or a bookies. You get a ticket with a number when you order… Swedes bloody love a ticket system! I’d describe the interiors at Babas as sort of retro-chic. The cosy booths are filled with a mix of school kids, colleagues and craftsmen all chowing down to the soundtrack of lovingly crafted rap and mainstream hip hop. I’m pretty sure that the staff music motto is “If in doubt, play Drake” which I fully appreciate. If there isn’t yet a Babas Spotify playlist out there then there absolutely should be. With three restaurants all south of central Stockholm (Högdalen, Nacka Forum & Heron City) it makes sense for these guys to offer better prices than their inner-city comrades. 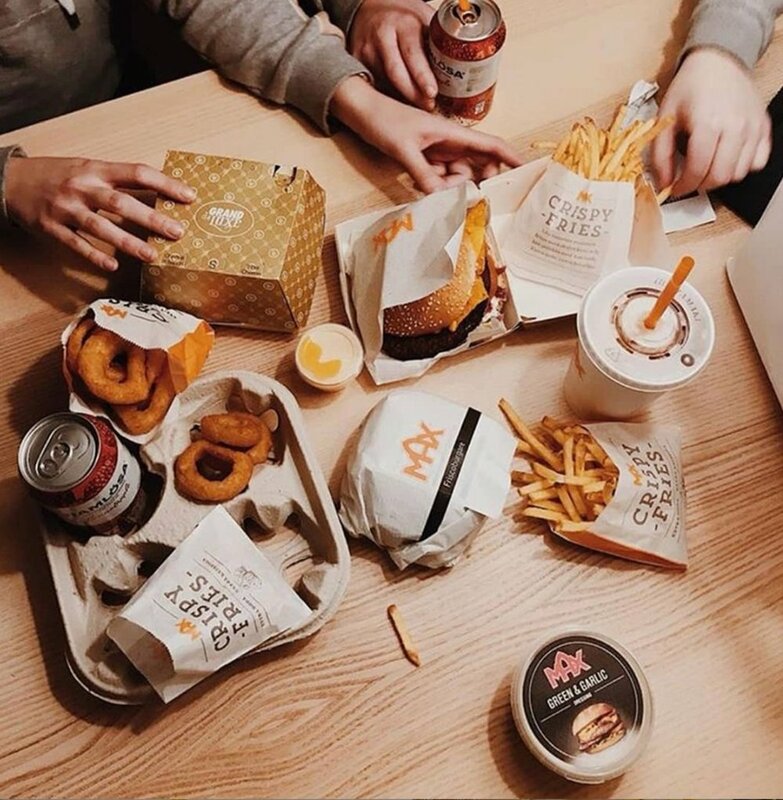 A meal deal including one of their many burger options, a generous portion of salty fries and can of something fizzy will only set you back by 95kr.